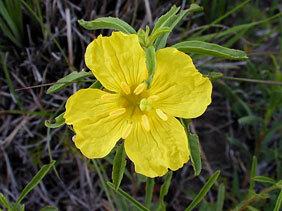 Also Called: Plains yellow primrose. Stems: Erect or decumbent, few to many, simple or branched from base, glabrous or hairy. Leaves: Alternate, simple, sessile, linear-oblong to narrowly lanceolate, 1/2 to 4 inches long, less than 1/2 inch wide, nearly glabrous or hairy above, gray-hairy below, often folded lengthwise; margins toothed or entire; tips pointed to rounded. Inflorescences: Solitary flowers, in axils of upper leaves. Flowers: 1-2 inches wide, floral tubes less than 3/5 inch long; sepals 4, distinctly keeled; petals 4, 1/4 to 3/4 inch long, about as wide, bright yellow, fading to pale yellow or pinkish; stamens 8; stigma disc-shaped, 4-lobed, extending nearly to tips of stamens. Fruits: Capsules, linear-cylindric, 1/2 to 1 inch long, 4-angled, thick-walled, slightly grooved, silvery-hairy; seeds many, small, brown. Habitat: Dry rocky, gravelly, or sandy prairies, hillsides, roadsides, and open woods. Forage Value: Serrate-leaf evening primrose is palatable and nutritious to livestock, particularly the new growth. It decreases on overgrazed rangeland. Comments: Serrate-leaf evening primrose is drought resistant. In addition to an extensive root system, the leaves fold in the midday sun, reducing water loss through their surfaces.